Conclusion of nation missions? Interesting, I didn't know they weren't concluded... but it makes sense to finalize any open storylines before XIV, so you can say XI is wrapped up if you want, and if you want to keep playing... hey, whole bunch of new crap on top of all the old crap, it's a too-much-crap-to-do-palooza! I know a lot of people are down right ticked about the new caps. I can understand if they had been doing say 5 to 10 levels a year for the past few years but to dump 24 out of no where in under a year is a bit much. My wife figure out the tnl for 98 to 99 ..she said it would be roughly 90,000 ( which may not sound like a lot but remember FFXI does not give you 1k or even 500 exp per kill) required. Now unless you have mobs dropping more then say 50exp a pop that is going to take an insane amount of time in party per level. Myself , I am more disappointed that SE changed its long held stance of lvl 75 being the final cap. For years we all knew that was it. Beat Maat and your set. I mean Maat fights once meant something . These caps just cheapen it in my opinion. A lot of the newer players will not know that same feeling of joy from beating Maat on a hard job. Instead odds are they will be greeted with an easy mode Maat and the knowledge they have 2 to 5 more G's to go. Did you guys also read that Alexander and Odin will require your astral flow to be in effect to be summoned? I don't know. I can see it for Odin but Alexander really is just a defense summon. u cna use astral flow with no avatar summoned and if u summon alex u automaticly astral flow same for odin. these avatars are 2hr based. yup, which to me is fine and all but a bit late in the game. Most of us expected Alexander and Odin clear back in ToAU, not in the same year that FFXIV is due to be released. yea conclude Wotg stories for all three nations. 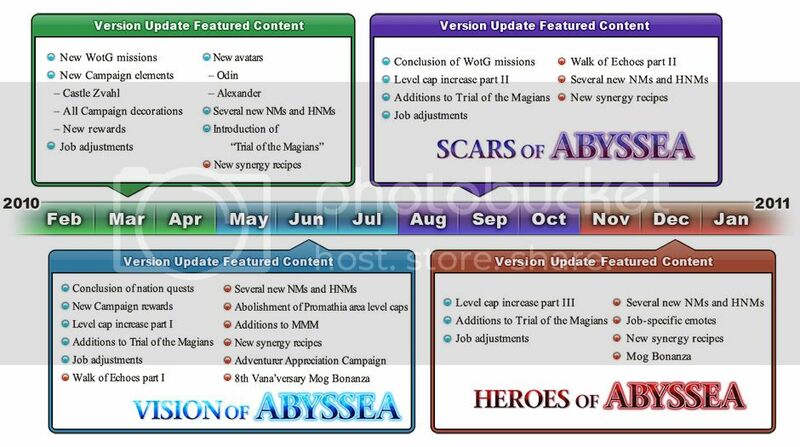 Subject: Re: 2010 Version Update Timeline!